Title: 'A System of Geography: or, a New & Accurate Description of the Earth in all its Empires, Kingdoms and States'. London: for A. and J. Churchill, 1701. Two parts in one volume. 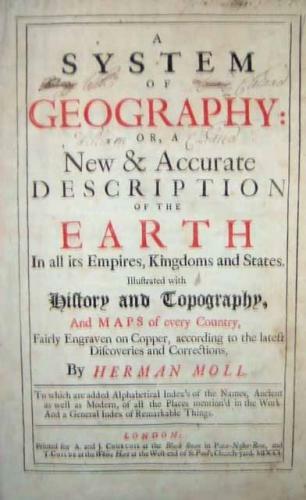 FIRST EDITION of Moll's important work with the title printed in red and black, 40 engraved maps, 2 full-page, small engraved map in text, 2 engraved solar diagrams. With a distinguished provenance. A Commander in the Royal Navy, William Clevland had a long and distinguished naval career. His son John, MP for Saltash and Sandwich, also pursued a naval career, and was appointed joint Secretary of the Admiralty in 1746, assisting Thomas Corbett, becoming sole Secretary on the latter's death. The condition is good: Short tear to map of Scotland, two maps and several text leaves browned in Part II, some very light dampstaining. Contemporary calf panelled in blind, spine in compartments (short split to upper joint, light wear to extremities).